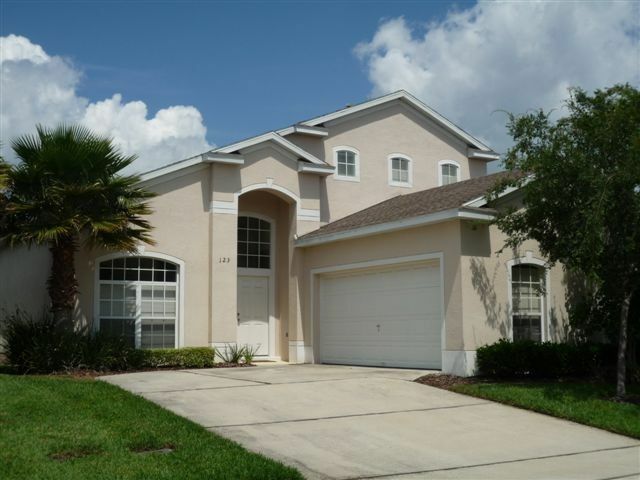 The villa is located just minutes from Disney World and other world famous attractions such as MGM, Epcot, World of Sport, Animal Kingdom and Downtown Disney. Universal Studios, Islands of Adventure and Seaworld are about 25 minutes drive away. Maintained, furnished and equipped to a high standard located within Hampton Lakes on the US Highway 27, a few minutes south from the junction with US Highway 192. It is only a five minute drive to local restaurants and supermarkets and approximately one hour's drive to the Atlantic Ocean or the beautiful beaches of the Gulf of Mexico. A detached two storey villa, comfortably accommodates 10 guests. The villa has 2 master bedrooms with en-suite bathrooms, a further three bedrooms a beautiful 13ft X 26ft heated pool with an extended deck, games room and internet PC. The community boasts communal facilities, two flood-lit tennis courts, beach volley ball, basketball courts, community pool, kid's playground, changing and toilet facilities. Great stay at his home.we enjoyed our time there especially the pool.we used it every day we could.the management group were quick to take care of any small problems we encountered.i advised him we would like to keep house in mind for future years. The property was fine, lots of space. Lovely house situated in a quiet neighbourhood. Parks easy to travel to by car. House is clean and well equipped. Very spacious and accomodated our group of 8 with no problems. Photos dont do it justice much nicer in real life. We had a lovely time and would definately recommend. Kyri was very helpful and responded to any questions very quickly. Thanks for the help in getting park tickets as well we got a much better deal. Thank you for your kind words. It’s always nice as an owner to hear that guests enjoy their stay and that you found the property to be clean and well equipped. Amazing villa with great location. We had an amazing time. The villa is lovely, very comfortable and spacious with everything we needed and more. Plenty of towels and linen. The pool and outside area are great and everything was clean and spotless. Disney parks are only 20-25mins away and universal parks are approx 35mins away, so the location of the villa was perfect for our holiday. We visited clear water beach one day and that is approx 1 1/2 hours from the villa, but well worth visiting. The whole booking process was so easy and stress free and the code locking system for the front door is genious. We received our personal code before we travelled so we could go straight to the villa from the airport. We would definetly recommend this villa. We were a group of 5 friends and we had more space than we needed. It would definetly suit larger groups aswell, family and friends. We are hoping to return with our family in a couple of years. We stayed at the villa in August for a 2 weeks Disney and universal theme park Holiday. It’s a 25 min drive to Disney and around 45 min to universal so not too bad and very straightforward a drive. The villa itself is lovely. It has 2 big ensuite suite bedrooms downstairs and 3 bedrooms upstairs (1 double and 2 twin) so perfect for us as we were sharing with friends/family. A large family bathroom upstairs along with a little seating area. A fab games room in the garage and a wash room downstairs with an open plan living/dining/kitchen area. The living area had plenty of seating for our party of 6 and it’s very comfortable. Kitchen is well stocked and Good WiFi too. Off the living room is the patio doors to the enclosed pool which is also great (when we had time lol) . The only issues we had (which aren’t complaints, just things we found and could be sorted easily for the next person) were the safe; this didn’t seem to be working. Also we had to report the dishwasher to the office too. This could have been easily avoided as the office knew about the dishwasher fault. Perhaps if someone just put a label on the dishwasher that said ‘please put the tablet in the upper rack’, we wouldnt have wasted 2 days thinking it was working and then needed to ring up .. not a big deal but could be easily avoided in future. Other places we managed to squeeze in were Boggy creek, international drive and in particular the titanic museum was excellent. We viited old town which we loved and watched the beautiful old car parade. Also lots of shopping malls if you fancy it. I loved everything about the villa and wouldn’t hesitate to return again or recommend. The owner has dealt with our booking perfectly even when dropping a night at the villa so we could stay over in Miami and check in later than planned. We can’t say enough about this vacation home!! We’re a group of 10, aged from preschoolers to grandparents and we had plenty of space for our 15 day vacation this month! The house was clean when we arrived, well stocked with all the kitchen essentials and some added extras like a crockpot and blender!! There were ample towels- both for bathing and swimming. There was also plenty of extra blankets. The location of the home is excellent, close enough to the parks but far enough away to be removed from the hustle and bustle. When we needed to call the management company for a couple of minor things ( low battery in smoke detector and front door lock) they were very pleasant and arrived at the house within 30 minutes of the call! We thoroughly enjoyed the pool and there was plenty of outside furniture for us all to sit outside too. Kyri was excellent to work with during the booking process and quickly answered questions we had before arrival. We’ve done multiple trips like this in the past and certainly consider this experience in the top few we’ve had!! Thanks so much!